As an off-“chute” of their successful Southern Rose Dolphin Cruise business, Chris and Janet Eberly started Chute ‘Em Up Parasailing in 2004 with one 6-passenger boat. Today, the Orange Beach-based business boasts another sixer, in addition to one 12-passenger and two 15-passenger parasailing vessels. Jack Fisher, who manages operations for the Eberlys, says you won’t only find the best boats, but the most amazing crew – including the Eberly children, Jason and Brittany. All parasailing operators at Chute ‘Em Up are USCG approved. The family owned and operated business also boasts the best prices on the island, and that’s a guarantee. Between Southern Rose and Chute ‘Em Up, the joint ventures can attract as many as 1,000 people a day during the summer season to their dock at Happy Harbors, 27212 Marina Road in Orange Beach. 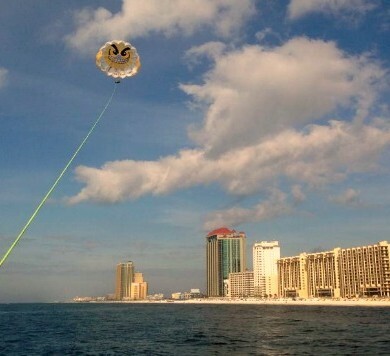 Because they have expanded to become the largest fleet of parasailing boats in the area, spontaneous flyers can generally be accommodated without reservations. However, if you have a large party, you can guarantee your adventure by calling a day in advance to book. Want to capture the moment for posterity? Pictures are available post-flight for $30, which buys you 40 to 60 digital images on an SD card. Rates start at $55 for single, $95 for double and $135 for triple flights, all with an amazing view of the beautiful Alabama coastline from 800 feet. Don’t want to go up, but hate to miss out on the action? Based on availability, you can score a seat in the boat for $20. If you find a cheaper price anywhere on the island, Chute ‘Em Up promises to beat it. “We want repeat customers and good community rapport,” Fisher says. For more information or to secure your flight today, call(251) 981-7673 or visit Chute ‘Em Up online. You can also tag your photos on their Facebook page for a chance to win a monthly prize drawing.